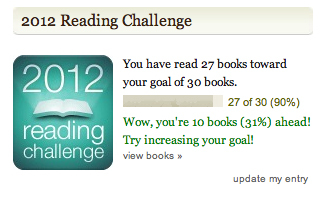 45 books! 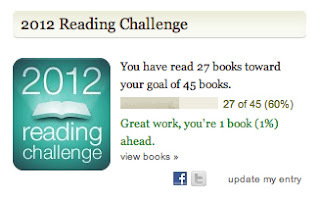 Last year (when my goal was 20 and I managed 24) this would have seemed impossible, but it's been a good year for reading. I'm learning to skim a bit when books are boring (a difficult but worthwhile skill for me) and that prevents me from wasting precious time on so-so books. And in respect to the authors, I only do it when the situation is dire. I'm also sticking firmly to reading only books I want to read, and not giving in to the books I feel I ought to read. Do you have a reading goal this year? It does! I'm really excited to read the book. Such a cool concept for a story! And I'm so glad you mentioned Arcadia! It's probably the one book on my list that I know the least about because no one I know has read it, but I'm really looking forward to it.